SUNRIVER, OR -- The beloved Sunriver trumpeter swan 'Chuck' was killed Thanksgiving Day. Sunriver Police Chief Marc Mills says shooting swans is illegal because they are not considered game birds in Oregon. He also says the incident took place in an area where hunting is not allowed. "We do not believe that it was an accident. It does appear to be a very direct and specific shot, to and or at 'Chuck,' that caused his injury. I think it was just cruel, and intentional, and we're certainly hoping that we can come to some kind of conclusion in the near future." 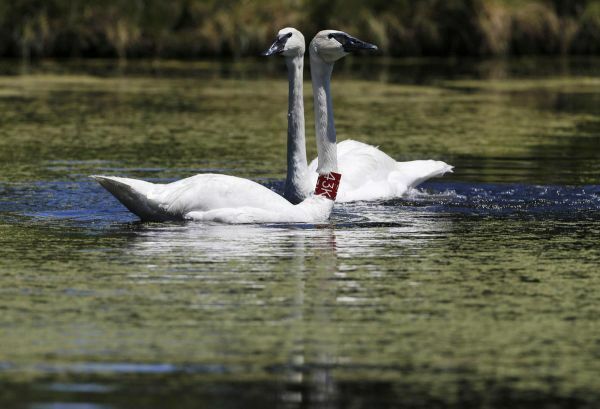 'Chuck' and his mate, 'Gracie,' had been placed at Lake Aspen in an attempt to reintroduce trumpeter swans to the area after the bird was hunted nearly to extinction in the 1990s. Four cygnets were hatched to the pair in early July. Chief Mills believes whomever shot 'Chuck' did so deliberately and could face criminal charges for killing a non-game bird, with a $5,000 fine and up to a year in jail. "We're working the investigation alongside the Oregon State Police, Fish and Game, with assistance, of course, from the Sunriver Nature Center, and we're doing our best to try and run down leads or any information that may lead us to the identity and potential arrest of the individual or individuals that shot 'Chuck'." A reward is also being offered by the Sunriver Nature Center and Observatory. Anyone with information is asked to call the OSP Fish and Game tipline or Sunriver Police. UPDATE 11/29/2017: The Sunriver Nature Center and Observatory is offering a reward for $1,000 for any information leading to the arrest and conviction of tghe person or persons who shot and killed Chuck on Thanksgiving Day. To contribute to the reward, call 541-593-4442. If you have any information, please contact the Sunriver Police Department or the Oregon State Police Fish and Game tipline.